The golden retrievers is a happy-go-lucky breed of dog that loves people. They make wonderful companions and are reasonably free of problems, but there are important things to consider when selecting your golden retriever puppy. 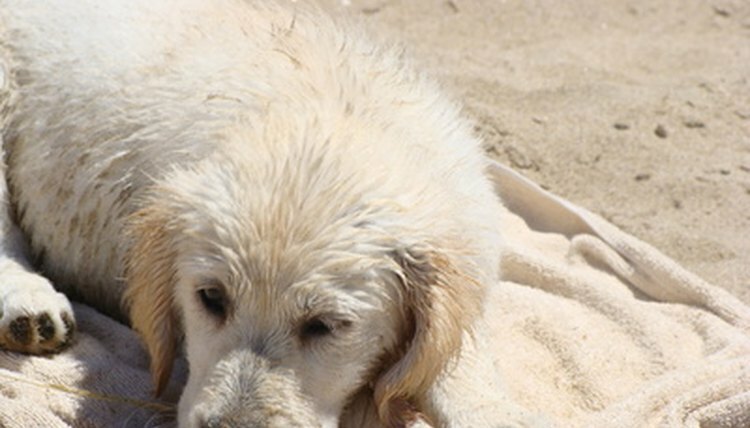 Understanding what physical and behavioral problems occur with golden retriever puppies and how to avoid them will give you a head start on a long and fulfilling relationship with your new friend. Golden retrievers are stable dogs not known for many behavioral problems. There are some issues that can lead to temperament problems that a puppy buyer should avoid. Inbreeding or careless breeding of unrelated dogs without regard to the disposition of the parents adds to the likelihood of future problems. Golden retrievers are socially oriented family dogs, so they are predisposed to separation anxiety. Golden retrievers are large, heavy-boned and sturdy, but the weight they carry combines to create a common problem in large dogs–hip dysplasia. The golden retriever puppy is at risk for problems in all of the "big four" areas–hips, elbows, eyes and heart. Do not buy a puppy from a breeder that does not run the proper tests to ensure good health, and never buy from a puppy mill or pet store. Other golden retriever puppy problems are allergies, hot spots, hypothyroidism, epilepsy and bone cancer. Usually temperamentally based difficulties are due to a lack of attention and exercise. Golden retriever puppies are active dogs that need lots of exercise. They are happy to lay on the couch watching TV with you, but only after you have played, jogged or taken a nice long walk with them. Do not expect your golden to self-exercise. They will likely stand by the door and whine for you to come back out. They do not like being away from you. If you do not train a golden retriever puppy early to accept periods when he will be left alone, in a crate or a kennel for his protection, the dog may become destructive or whine and cry when you're gone. Physical problems range from those that can be controlled or cured with medication to those that are terminal. Rather than a cure, new golden retriever puppy owners should look for breeders who thoroughly test their breeding stock for major problems like hips, elbows, subaortic stenosis and osteochondritis dissecans. The breeder should also have information on the less severe health concerns of all their animals and the immediate relatives and ancestors of their dogs. Ask a breeder for the Canine Health Information Center numbers. CHIC is a database for dog-related health screening tests from the various medical programs such as the Orthopedic Foundation for Animals for hips and Canine Eye Registration Foundation for eye testing. It gives breeders, puppy buyers and other interested parties a place to find out about the health of any dog that carries a number in the system. The golden retriever takes several years to fully mature. The puppy may look like an adult on the outside at 6 to 8 months of age, but he is still growing on the inside. Both physical and mental maturation is not complete until about 2 years of age.